Forte produce state of the art treatments for your car to maximize it's efficiency and performance and enhance it's longevity. 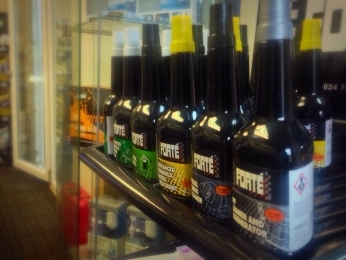 The full range of forte engine treatments is stocked so next time you have a service with us ask about the treatment, you wont be disappointed! Advanced Formula Motor Flush - 11.50 Inc VAT - Cleans engines internally and provide anti-wear protection Frees sticking piston rings, hydraulic valve lifters and variable valve timing systems Removes large amounts lacquer varnish but also sludge deposits from the crankcase Neutralizes crankcase acids, keeping new oil cleaner, for longer. Petrol Saver - 11.50 Inc VAT - Cleans the vehicle fuel system, Restores efficiency, Improves engine performance and response, Reduces fuel consumption, It also reduces hydrocarbons from the exhaust. Advanced Formula Diesel Treatment - 14.00 Inc VAT - Reduces smoke (Black) emissions, Restores injector spray patterns, Improves engine performance and response, Maintains EGR valve and also keeps the EGR clean from Carbon diposits, Lubricates and extends the life of injectors and fuel pump. Bio Degreaser & System Flush - 17.60 Inc VAT - Removes oil, sludge, scale and rust deposits from all around the engine, Restores heat transfer efficiency and prevents heat-related engine failures. Radiator Stop Leak & Cooling System - 15.50 Inc VAT - Effects emergency cooling system repairs to prevent loss of coolant, Keeps vehicles on the road until the replacement components become available, Enables extended trips to be completed without costly repairs or wasted time in the event of a cooling system leak, Removes oxygen from the cooling system to prevent limescale and corrosion build-up inside the whole of the cooling system. Diesel Turbo Cleaner - 14.00 Inc VAT - Cleans sticking Variable Geometry Turbos without dismantling the turbo, Actively reduces soot emissions, Cleans EGR Valves And it also Compatible with all diesel engines. Products Pricing Is Shown Above.